» the yummiest fabric on the planet! 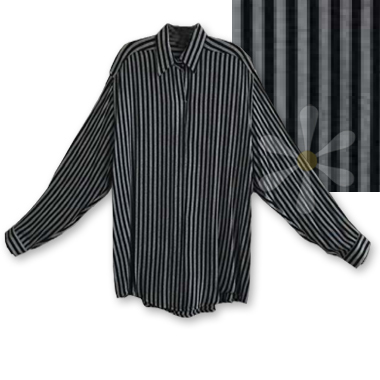 The tailored shirt style you've asked for is available right now in our unique silver-gray and black stripes! Cut to fit perfectly on men and women, it's generous and comfy with a neat collar, long cuffed sleeves, and a full collar-to-hem tab front that hides the button closures. Say who you are with what you wear, everyday... why not?